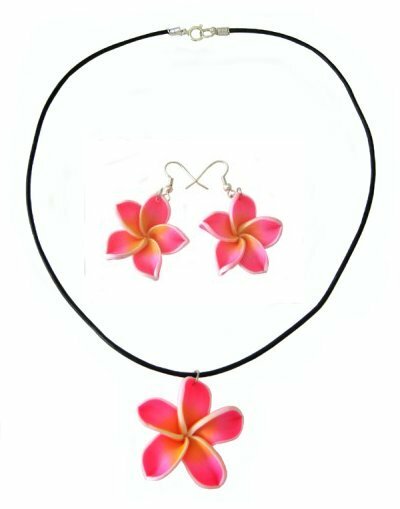 What better way to feel you are lost in a tropical paradise than to wear some beautiful frangipani jewellery. Below we have some great deals on earrings, necklaces, earring & necklace sets, hair clips, key rings, belly rings and even some bling for your mobile phone! If you like vibrant colours, why not try our new jewellery range. 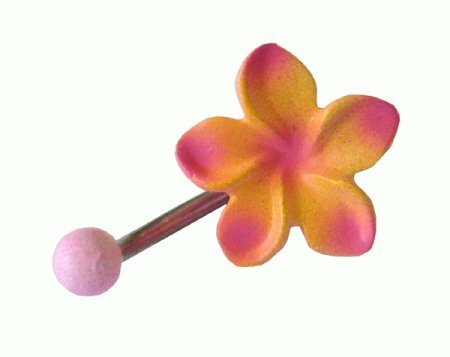 Our earrings have silver steel hooks and the flower is 3cm wide (or 1.25"). The photo at left shows our Pink earrings, while below that you can see an example of our earrings in orange and white. Sorry - due to end of stock line only orange available! These earrings are moulded from quality painted resin and have silver steel posts. Designed in Australia by Pretty Original Products (POP). These earrings are designed in Australia by the Jantke Art Studio. The earrings are nickel plated with silver surgical steel hooks. The frangipani charm is a high resolution print sealed in a resin coating and mounted onto a tough nickel plate. This means the earrings are flat, not moulded. 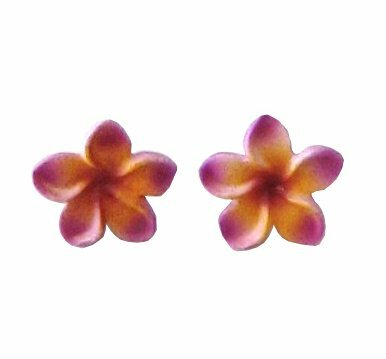 The frangipani charm measures 20mm by 20mm (or 3/4" by 3/4"). Available in pink or white. If you like vibrant colours, why not try our new jewellery range. Our necklaces come in 2 flower sizes: the large flower is 4.2cm wide (or 1.6") and the medium flower is 3cm wide (or 1.25"). The photo at left shows our Orange/Red flower necklace on black waxed cord. But you can choose from a range of cord colours including pink, hot pink, orange and black. 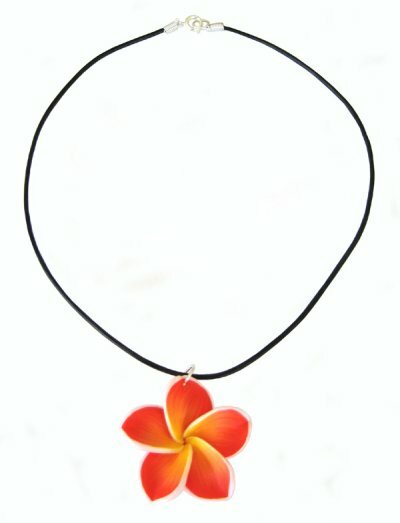 The frangipanis are available in Orange, pink and white. This necklace has 5 frangipani flowers moulded from quality painted resin surrounded by wooden beads. Designed in Australia by Pretty Original Products (POP). Or why not buy the set and save $6.00!. We have sets available in three colours - pink, orange or white, and in 2 different sizes - Large or Medium. 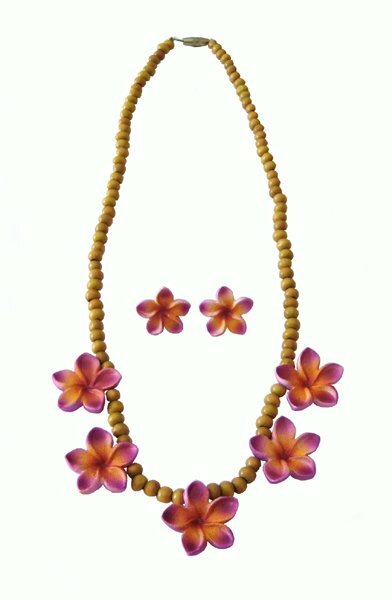 The Large has a larger frangipani flower on the necklace than the earrings. The medium has the same size flower on the necklace and the earrings. Our Price: $19.95 (Medium) and $21.95 (Large). Sorry - due to end of stock line only orange sets available! Save $5.00 on our Pretty Original Products (POP) necklace and earring set. Our vibrant hairclips come in 2 flower sizes: the large flower is 4.2cm wide (or 1.6") and the medium flower is 3cm wide (or 1.25"). 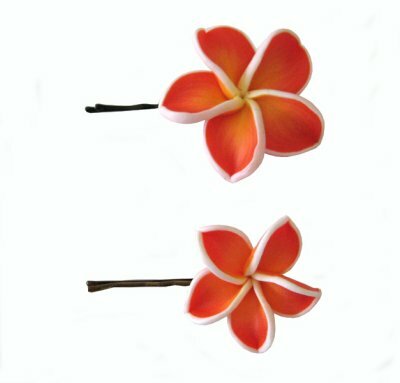 The photo at left shows the two sizes of hairclips available in our Orange / Red frangipani. As with our other Vibrant jewellery, these are also available in pink or white. You can buy them singly or save money by buying a 2 pack. Our Price: Medium $5.95 each or get the 2 pack for $10.00 (not available in white). Why not treat yourself to this gorgeous frangipani belly ring. Designed in Australia by Pretty Original Products (POP). Our vibrant keyrings are made with handcrafted Fimo beads. Our keyrings come in 2 flower sizes: the large flower is 4.2cm wide (or 1.6") and the medium flower is 3cm wide (or 1.25"). The photo at left shows the large keyring in our Orange frangipani. Also available in White, Yellow, Blue, Deep Pink or Hot Pink. Our Price: Medium: $7.95, Large: $9.95 . Please Note: Medium Keyrings only available in Hot Pink or Orange. These keyrings are designed in Australia by the Jantke Art Studio. The frangipani charm is a high resolution print sealed in a resin coating and mounted onto a tough nickel plate. This means the charm appears flat, not moulded. 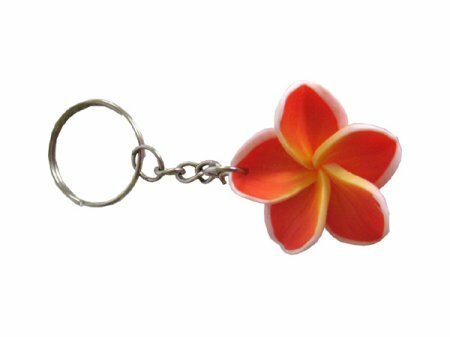 The frangipani charm measures 42mm by 35mm (or1.5" by 1.3") and the entire keyring is 9.5cm (.753") long. Available in pink or white. Note: Please choose your charm colour before clicking "Add to Cart"
These mobile phone charms are designed in Australia by the Jantke Art Studio. The frangipani charm is a high resolution print sealed in a resin coating and mounted onto a tough nickel plate. This means the charm appears flat, not moulded. The phone charm also contains a chain with 3 love heart charms set with a pink coloured stone. 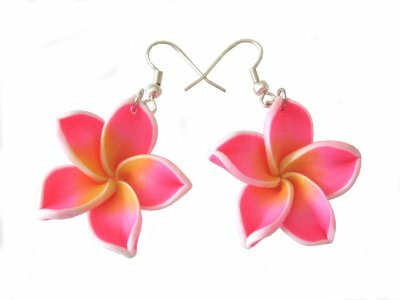 The frangipani charm measures 20mm by 20mm (or 3/4" by 3/4") and the entire charm is 8cm (3") long. Available in pink or white.